Whether you’re a die-hard JDM fan, or you’d just like to know the history of Paul Walker and his love for the Nissan Skyline, we’ve covered it all in this guide as we pay our respects to the motoring legend. Here, you can click on a particular section within this article, otherwise, scroll down as we take a look back at Paul Walker’s Nissan Skyline history. Which Skyline(s) did Paul Walker drive? Is the Nissan Skyline GT-R R34 legal in the US? Paul Walker was undoubtedly best known for his role in The Fast and the Furious franchise, but little do most people know that Brian O’Conner shared many passions and hobbies with his on-screen alter-ego. He was, in fact, a complete petrolhead and lived his life to the maximum in every way imaginable. Even off the F&F set, his love for all things automotive was clear up until the moment of his deeply tragic passing. In this article, we don’t wish to talk about the controversial circumstances that surrounded his passing, but rather to pay testament to a fellow motor enthusiast. This article will cover everything you need to know about Paul Walker and his enthusiastic passion for Godzilla – the Nissan Skyline GT-R.
Born the fourth ‘Paul Walker’, he would often speak of his grandfather – Paul “Irish” William Walker, who was a factory racer for Ford. His motorsport blood continued with his father, who also went on to race throughout his childhood. His first ever car was a beaten-up 1986 Ford Ranger, which he happily recollected that his father would often spend time helping him fix. Little did they know at this time, but Paul would later be lucky enough in life to go on to own one of the finer collections of legendary cars out there. There was something about Paul Walker which made him more relatable than the rest of the cast in the F&F movies. His cool, laid-back attitude and awesome taste in Skyline’s undoubtedly contributed to that, but the fact that he truly lived and breathed a genuine passion for all sorts of cars was the icing on the cake. In this early interview from 2001, shortly after the first F&F film was released, you can just tell how much Paul loved the R34. It’s also easy to see his true passion shine through, where he speaks about his recent love for Skylines, namely the R33, before finding his true match in the R34. After being told the details of the film, without even having a script, Paul knew that he wanted to give the original movie a shot. He would then go against the advice of his representatives to pursue a subject he was passionate about and from here, The Fast and the Furious was born. Whether you love or hate F&F, it undoubtedly was scripted for Hollywood rather than the true enthusiast. From the eleventy-thousand gearshifts in the drag race through to the *DANGER TO MANIFOLD* moments. However, Paul also knew this and being down to earth as he was, he’d frequently speak out loud about his concerns on the excessive moments in their movies. However, despite its issues, the franchise certainly had its place in the market and gained huge popularity before eventually becoming a complete game-changer for the import, drag and drift scenes, bringing them to the forefront of Hollywood for the first time. It also brought the cars which we know, love, and continuously write about here at Drifted to the forefront of the mainstream and for a lot of people, this would have been the first time they’d ever seen or heard of the Nissan Skyline, or the various other import cars such as the Toyota Supra. F&F then went on to pay homage to a wide range of GT-R’s, from the first-ever Skyline, the Hakosuka, right the way through to the modern-day R35 GT-R.
There’s no doubt that Paul Walker’s passion for these cars played a role in their continuous features in the movies. In turn, this has contributed to the borderline-mythical reputation that the R34 GT-R has earned today, which has seen their prices skyrocketing to all-time-highs. Paul Walker’s passing undoubtedly left a huge hole in the F&F set, and the goodbye song was one of the most spoke-about teary-eyed moments in movie history. For many enthusiasts, Paul was more than just an actor, he was one of us, an ultimate gearhead. There is little known about his personal history and the fact that he even owned a tuning shop named ‘Always Evolving’, which also played home to his ever-growing car collection. From BMW’s, Porsche’s and Audi’s, he also had a love for supercars such as Ferrari’s. However, the import scene undoubtedly played a huge role in his passion, with a selection which partly included a Nissan Silvia S15, a Toyota Supra and his beloved R34’s. There’s no question that Paul Walker enjoyed living his life just like he did in his movies – Fast and Furious, and the same can certainly be said for his extensive car collection. He undoubtedly had a huge amount of love for the E36 M3, once stating that there was only ever sixty ‘Lightweight’ models in the US, and he owned seven of them! 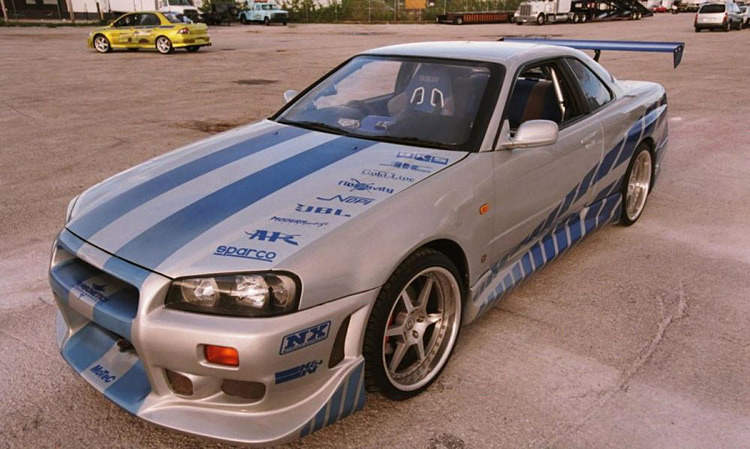 However, as soon as the F&F series began, Paul had his first taste of the Skyline life, and he instantly caught the bug before then going on to own at least half-a-dozen Skyline’s, with at least four or five of those being R34’s. These were well-known for keeping the infamous RB engines, with them mostly pushing out around 5-600 horsepower and mostly tuned by Japan’s very own Matchless Crowd Racing, best known for their street-orientated fast, responsive tunes. Forgive the terrible camera work, but this otherwise great video from TheSmokingTire seems to be one of the only videos online which shows off the incredible car collection of both himself and Roger Rodas. A little-known fact is that Paul Walker’s personal cars were used in the F&F movies, including a GT-R and the Toyota Supra which you can see in this video. Within 24 hours of Paul’s passing, there was even more drama unfolding as over 30 of his cars went missing, with his warehouse worker illegally removing them before attempting to extort the family for money. Devastatingly, it seems that a few were sold, but we’re hopeful that these have since been recovered. We love this video, as it shows a true petrolhead living his dream. Japanese tuning powerhouse Mine’s are arguably the most legendary GT-R tuners on the planet. For those who aren’t clued up on the JDM scene, you may well remember their original R34 GT-R from the Gran Turismo series. When Paul got handed the opportunity to put the pedal to the metal on the open road in the motherland, using this 600-horsepower AWD beast, his passion for these cars really shines through, alongside his awesome sense of humor. All proceeds from the video will be donated to the Paul Walker Foundation, a charity launched by Paul’s daughter as a tribute to his enduring legacy, so please feel free to watch away to your heart’s content! In the movie, with the Police impounding his 1991 Dodge Stealth in Dallas, Brian gets a ride to town, where he locks eyes on his next weapon – a metallic green R34 Skyline. After purchasing the car with his previous winnings, he immediately gives it a freshen-up with a silver respray and the infamous strips, before carrying out some essential upgrades in the garage (400-speed gearbox anyone?) He then added a GT-R badge in the grill and also fitted the memorable underglow to the body. Brian’s notorious bridge jump then follows, and he wins the race before everyone is forced to flee when the cops arrive. For those of you that are fans of the film, you’ll probably remember the ESD ‘harpoon’ moment (seems legit!) which then got the car impounded. The R34 suffered a ruptured oil pan and severe damage to all four rims during the bridge jump, but they were soon repaired. The car included a C-West body kit, 19″ HRE 446 rims, House of Kolor platinum pearl paint and a C-West BGW. Under the hood was the usual RB26DETT (for some shots that is, we’ll discuss that in more detail later) which pushes out around 330HP in stock form. However, since it had ALL the nitrous (three bottles in the passenger footwell to be precise), this was clearly a lot higher. For the fourth movie, Brian opted for the far more tasteful (hey, we’ve all been there, right?! ), stock-looking Bayside Blue GT-R alongside a pearl white one. 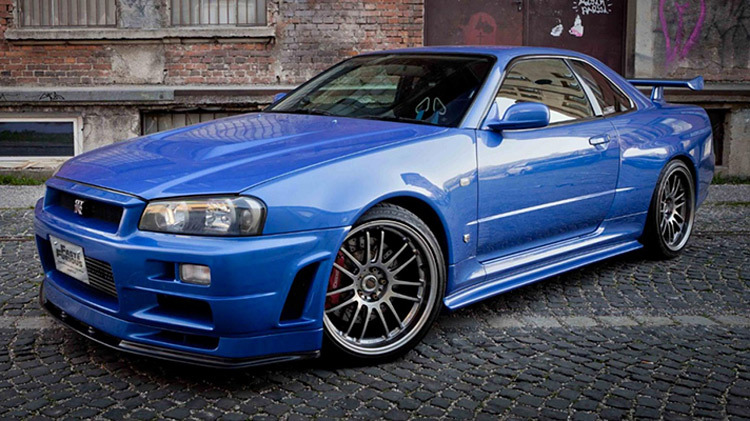 This ended up being quite possibly the most famous, and expensive, R34 GT-R to ever be sold at auction. Partly due to it having just 6,000km on the clock, but being driven by Paul Walker in the films undoubtedly helped to pump up the price tag. It seemingly sold for an undisclosed price, but it was up for a jaw-dropping $1.37m! Prior to Paul’s passing, the car originally sold for $350,000, in a package deal which came with a meet-and-greet with the star himself. We’re fully aware of JDM tax, but that’s quite a substantial increase! For JDM, Paul Walker, and F&F fans alike, the car really is the perfect Skyline to have in any collection. Despite undergoing a VR38DETT swap in the movie, it, in reality, still had the original 2.6L powerplant under the hood, providing around 550hp to all four wheels, alongside a 6-speed Getrag shifter. Not only that, but it also featured Nismo lowering springs, a custom roll cage, Volk wheels, and a big brake conversion. A 40-page appraisal with the car proved it was used in the movies, which valued the car between $900,000-$5m! We hope it eventually sees the light of day eventually, but it’s most likely ended up stationary in a collectors garage, disappointingly. To put the cars price tag in comparison to show just how sought after the GT-R is, the Supra which also featured in the movies sold for $185,000, which proves just how much more desirable the GT-R is! More recently, following the ‘Fast Live’ series, there have been a handful of replica cars go up for sale. Interested to know more about Fast Live? We headed to the show to share our thoughts in this article. After having his first R34 impounded and the Bayside Blue GT-R destroyed in the movie, Paul Walker couldn’t resist adding the original first ever Skyline to wear the honoured GT-R badge. We’re told that each car he drove was personally chosen by him, so he certainly had good taste, and a nice budget to match! Thankfully, there were no stunts involved with the Hakosuka and he simply drove the car across Brazil, eventually ending up in Rio de Janeiro. The Hakosuka is a treasured icon in the motherland, and although we have no idea where this car ended up, it undoubtedly has a hefty price tag attached to it! Those of you that are JDM or Skyline purists may want to look away now! There’s no secret that Hollywood isn’t quite what it seems, and while you may have been disappointed to hear the Bayside Blue GT-R actually didn’t have a VR38DETT under the hood, we’re not entirely sure if you’re prepared for what some of them had hidden under the hood… Sorry, trunk! Firstly, when shooting the movies, the production team realized that the suspension and driveshafts on the GT-R’s were TOO good. This meant that they weren’t able to pull off the stunts they wanted. This meant that they had to remove the front driveshaft and disable the AWD system so that they could throw it sideways. Most of the R34’s used during the shooting were, in fact, GT-T’s with fiberglass replica shells, not GT-R’s, quite understandably. This also meant that fewer modifications were required to throw them out of control. During certain scenes, fiberglass replica shells were even used, mounted to dune-buggy chassis’! If you’re a big fan of the series and don’t want your childhood dreams ruined, you may want to look away now – if you’re unphased, then welcome to Hollywood! You’re seeing that correctly! At least it’s good to know that an R34 GT-R wasn’t butchered for their needs, right?! 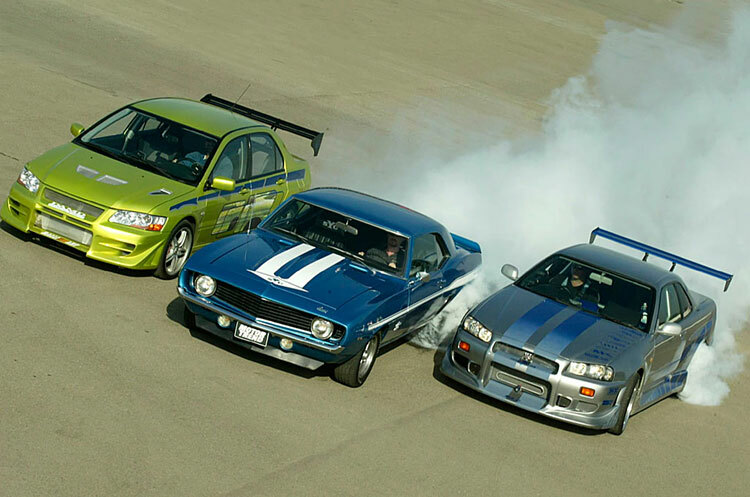 Not only did he get to choose the cars he drove in the series, and from what we understand, he also selected a lot of the mods, Paul Walker even managed to encourage the movie bosses to let him carry out some of the stunts which made the cut himself. The moment when Brian power slides towards the crowd after winning his first race was the first true Paul Walker stunt to make its way into the movies. After that, he then went on to perform more stunts himself, including the high-speed 180-degree turn in the Evo VII during the highway chase. At the current moment in time, the GT-R still has a fair few years to go until it reaches the 25-year US import legislation to make the car road legal. However, if you’re desperate for a GT-R and can’t wait that long, the R32 GT-R can already be imported due to now being over 25-years. Alternatively, the Hakosuka is also legal, but expect to have to splash big bucks on a tidy example. 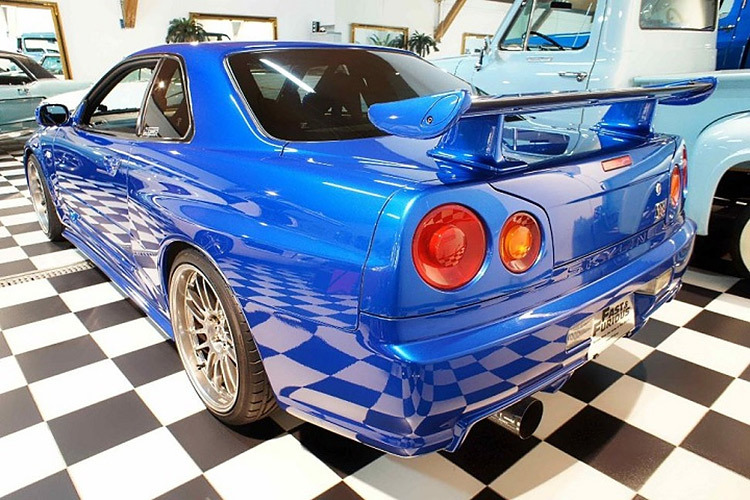 With the first R34’s leaving the showroom in 1999, you’re going to need to wait until 2024 before you’ll be able to legally own one on the road. With that being said, there have been several illegal imports and ‘law-bending’ R34 GT-R’s which have hit the states. However, unless you want to keep it hidden in your garage, we highly recommend against it – the last thing we want to see is a crushed GT-R! However, you’re currently living in the rest of the world, chances are that you’ll be able to get a road-legal R34 GT-R if you have the cash to splash! Looking to hit the track with a GT-R? For most of us, the closest we’ll be able to get is video games. However, the positive of this is that almost every game out there features the GT-R.
From the original Gran Turismo series which we mentioned earlier, right the way through to present day phone games which you can play on the go, such as Drift Hunters. For those of you looking for a video game throwback, this may well encourage you to search for your old console in the basement! We hope that we’ve managed to cover everything you’ve wanted to know about two legends, Paul Walker and the Nissan Skyline in this article. There’s no question that the GT-R R34 was Paul Walker’s weapon of choice, and even with the release of the modern-day R35 GT-R, it was clear which one stole his heart. It was never any secret that Paul was a huge petrolhead who lived and breathed the dream of owning and driving some of the best cars in the world to their limits and even had the opportunity to learn them inside out in his tuning garage. It may not be the prettiest engine ever produced, but there’s a reason that it’s continuously increasing in popularity and becoming more sought after than ever. We’ll leave you with this memorable video as we look back over some of the finest and most memorable moments of a true legend that was taken from us far too early. 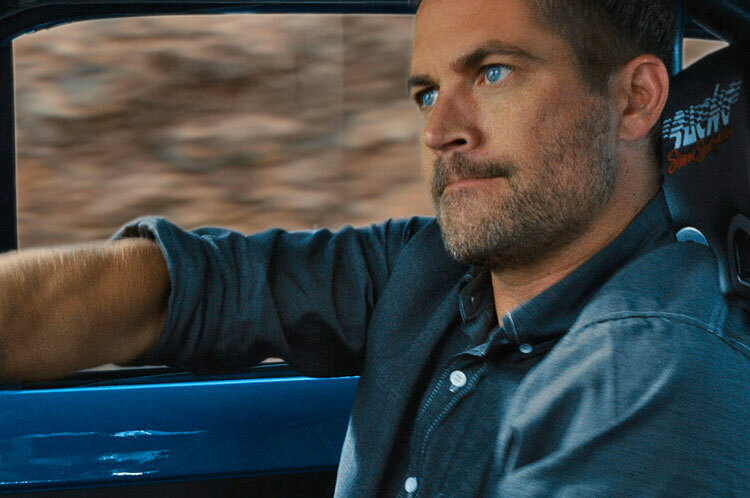 We’ve selected some of our favorite Paul Walker YouTube picks for you to enjoy! This great video gives you a unique look around the Bayside Blue GT-R which went up for sale with a big price tag. Take a trip down memory lane as Brian brings his first Skyline to the meet. Here’s a great insight into every car in the F&F line-up from the guy that built them.